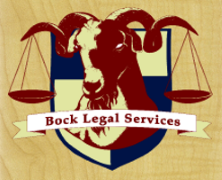 Bock Legal Services is a small, family-oriented law firm whose mission is to help people and businesses navigate everyday civil issues. Mission Statement - To provide my clients with excellent customer and legal service, be a valuable counselor in times of need, and maintain the highest level of ethical integrity. To provide my clients with solutions they desire when possible at competitive rates. To be loyal, courteous, and zealous at all times. 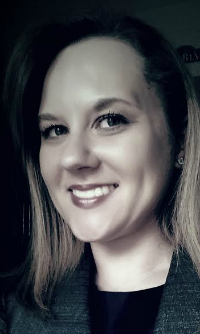 To be a vigorous advocate for my client while adhering to my client's interests and confidentiality. To show my client that civility is not equated with weakness, but to be tough when the time calls for it. Attend to my clients as if they were my own family. Promptly return phone calls and emails, and keep the client advised as to the status of their case. Listen to my clients' concerns and provide sound legal advice in a way that is easy to understand. Give my clients the knowledge they need to make an informed decision. Maintain a network of attorneys to solve legal problems. Avoid costly court battles and legal strategies that will produce negative results. Use technology efficiently to keep client costs low and heighten my legal services. Negotiate settlements as quickly as possible. I grew up in the Dayton area and am happy to call it home. I earned my Associate's Degree from Sinclair Community College and my Bachelor's Degree from Wright State University in Criminal Justice. While an undergraduate, I was a member of the Stop the Violence program, where I was an advocate for teens involved in domestic violence and school bullying. I was inducted into Phi Beta Kappa, the nation's most prestigious academic honor society, and graduated with high honors. I began my law school career at the University of Dayton School of Law in 2010 where I earned my Juris Doctorate and Master of Laws. During this time, I was an officer in the Intellectual Property Society, the Constitutional Law Society, and Phi Alpha Delta, a law fraternity dedicated to community service. I was in the Academic Success Program, which put me on a fast-track to graduate early. I was also an active member of the Leadership Committee as well as a recruiter for the University of Dayton School of Law. 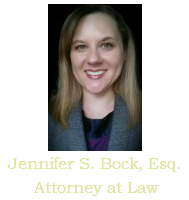 Admitted to the Ohio Bar in May of 2013, I am also licensed to practice in Federal Court for the Southern District and Northern District of Ohio. I have experience working in multiple areas of civil practice, including bankruptcy, personal injury, creditor collections, foreclosures, and landlord/tenant law. I have worked with some of the largest and smallest law firms in the area. I am also of counsel for the Gitmeid Law Firm and Reznik Law Firm in New York. Additionally, I am fully committed to my community. I enjoy giving back to organizations such as United Rehabilitation Services, Equitas Health (formerly the Aids Resource Center), the Leukemia and Lymphoma Society, PBS, area daycares and the Artemis Center, just to name a few. I was the Artemis Center's Krewe Champion of the Year in 2014, raising over $7,000 for them in just a couple of months. I also do pro bono legal work monthly. I still live in the Dayton area with my husband, Ian, and our daughter, Aria, and love reading, music, and the performing arts. I have a reputation among my clients as someone who is firm, fair, honest, and will fight to make sure they receive the best possible outcome under the law. Contact me today to find out why!